Richard realizes that, in order to save up enough money to leave Jackson, he must pretend to be docile and deferential to whites, and must do everything he can to hold a relatively high-paying job. He begins working as an assistant at a drugstore soda fountain, but in his attempt to get along with the white managers, he becomes awkward and slow, continually confused by how best to respond to outbursts of white anger. He is “let go” by the soda fountain, since they believe he is not up to the work. Richard is not a clumsy person, but he still gets flustered when a great deal is asked of him in a short period of time. Here, at the soda fountain, he is bombarded with requests and cannot process them all at once; as a result, Richard is fired from the job, and forced to find work that is more suitable to his relatively serene and somewhat brooding temperament. At this point, it is the fall of 1925, and Richard does not go back to school for tenth grade. He takes a job as a mop-boy in the same hotel where Ned’s brother was murdered—a hotel that is used as a brothel by white men and white prostitutes. Richard worries that he will not be able to keep himself out of trouble with the white patrons, but he befriends several of the other black workers, who are “smooth” around white people, and Richard slowly learns how to stay out of the way of the white guests. When one white man slaps a black female coworker of Richard’s on the backside, Richard attempts to be civil to the man, but later chastises the woman for allowing the man to treat her so poorly. But the woman replies that Richard does not understand how things are at the hotel, and that he shouldn’t worry about such overtly racist and sexist white behaviors. Richard’s time at the hotel, however, is perfect for him. The pace is a good deal slower than the soda fountain, and at the hotel there are many other African American employees, some of whom are kind to Richard. It is difficult to imagine, but other than these employees, as well as Shorty and others in Memphis, and Griggs, there is almost no one with whom Richard is close friends. Richard has spent much of his young life in the company of a family who largely ignores him, or with himself, reading and writing. Thus, these moments of friendship are revelations to Richard. Richard also learns that many of his black coworkers, along with black men like Griggs, who work in other places, steal frequently from their bosses in order to supplement their low wages. Richard has never stolen before, but he worries that he will save money so slowly if he does not steal that he will never be able to leave the south before something bad happens to him—before another run-in with white men causes him to lose his life. Richard considers whether he could steal a neighbor's gun—he knows where it's located—and earn money from stealing at his job more quickly. These two illegal acts could allow him to depart from Jackson and head north more quickly. Richard knows that stealing is an absolute wrong—he does not want to steal, and he understands that no society could exist if it were founded on stealing. But Richard also knows that the system in which he lives and works is “rigged,” meaning its impossible for an African American man to get a fair chance at living a prosperous life. Therefore, Richard begins to understand that he can only leave the South by cheating those who have cheated him his entire life. Richard considers his options and is promoted to bell boy at the hotel; he often goes into the rooms where white patrons and their white prostitutes are “entertaining,” but these patrons only tend to yell at Richard when he looks at them or reacts to them overtly. Otherwise, Richard is more or less invisible to the white guests at the hotel. One day, a fellow worker at the hotel tells Richard that a movie-house in Jackson, owned by a Jewish businessman, is looking for ticket-takers, and that this job would allow Richard to steal by reselling tickets and pocketing the difference in the house’s earnings. Richard decides this is his chance, and is given the job by the businessman, who sees that Richard has no criminal record of stealing. Richard recognizes that his job as ticket-taker could be the way in which he leaves the South. He also understands that it is in some ways far more dangerous to be a young African American adult in the South, than an African American child, since white men are more inclined to fight, and perhaps murder, an African American man for any perceived slight, real or imagined. Richard, paradoxically, is hired to steal from the owner because he does not having any theft on his record. Richard begins working and, one afternoon, is called to by a man who knows another female employee at the house. The man tells Richard that the owner will be out that day, and that they can put their plan into action, reselling tickets. Richard is nervous to steal, but recognizes that this might be his best shot to make money quickly. The man orchestrates, with Richard and the female employee (named Tel), the reselling of tickets, and at the end of the busy weekend night, Richard has made fifty dollars. He goes through this nerve-wracking process of theft the following weekend, and has saved 100 dollars, or roughly the amount he believed he needed to be able to flee northward. This is one of the few times in Richard’s life that he receives a break. Typically, Richard has been on the unfortunate end of things—his brother receives a better “placement” with Aunt Maggie in the north; Richard’s Granny, Uncle Tom, and Addie all assume that Richard is causing mischief when he is in fact keeping to himself. Thus, Richard seems to recognize here that, although he knows stealing is wrong, he has been due for some good luck, and perhaps it is time for him to make his escape. Richard then steals the gun located in his neighbor’s (empty) house, and gathers two friends to help him steal cans of food from a local college’s pantry. Richard buys clothing and a suitcase, and announces to his family one night that he is leaving town, for Memphis, and that he won’t be returning any time soon. His mother worries that he is leaving to avoid some crime he has committed, and Richard does not deny this explicitly. Instead, he tells his mother he loves her, apologizes for the difficulties they have shared living in Jackson, and rides in a “black-only” coach north to Memphis. Richard reflects, at the end of the chapter, that he hated the feeling of theft, but considered it necessary to leave Jackson. He also writes that he never again stole, for the remainder of his life. Mercifully, Richard is never in a position where he has to use this gun—one can only imagine the disastrous consequences of such a choice. In many ways, the character of Bigger in Wright's Native Son is a version of Wright’s own, younger self, had Wright been forced to make the kind of destructive, difficult choices Bigger makes. Thus Richard understands that he has been lucky—at least, lucky enough to educate himself and to leave the Deep South—even if his young life has been one of intense suffering and privation. Schlegel, Chris. "Black Boy Chapter 10." LitCharts. LitCharts LLC, 18 Jun 2014. Web. 19 Apr 2019. Schlegel, Chris. 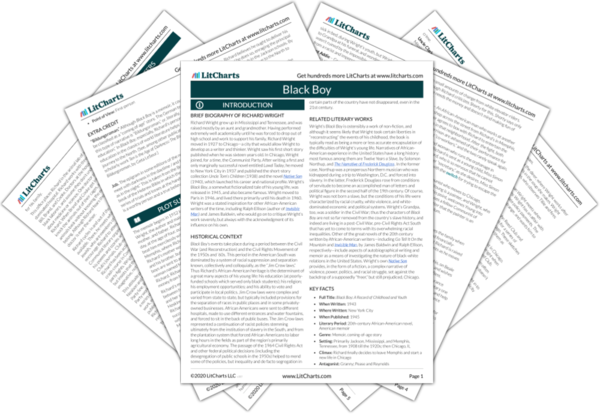 "Black Boy Chapter 10." LitCharts LLC, June 18, 2014. 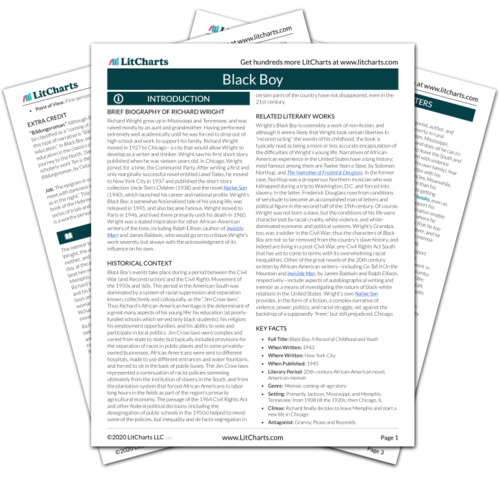 Retrieved April 19, 2019. https://www.litcharts.com/lit/black-boy/chapter-10.